Only 12 million years old, or less than three-thousandths of the age of the Sun, Beta Pictoris, as seen in this space wallpaper, is 75 percent more massive than our parent star. Only 12 million years old, or less than three-thousandths of the age of the Sun, Beta Pictoris, as seen in this space wallpaper, is 75 percent more massive than our parent star. It is located about 60 light-years away toward the constellation of Pictor (the Painter) and is one of the best-known examples of a star surrounded by a dusty debris disc. Earlier observations showed a warp of the disc, a secondary inclined disc and comets falling onto the star, all indirect, but tell-tale signs that strongly suggested the presence of a massive planet. 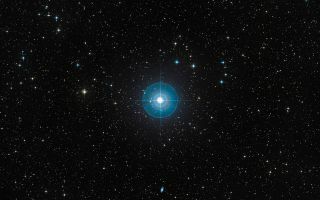 Observations done with the NACO instrument on ESO’s Very Large Telescope in 2003, 2008 and 2009, have proven the presence of a planet around Beta Pictoris. The planet has a mass of about nine Jupiter masses and the right mass and location to explain the observed warp in the inner parts of the disc. This image was released March 6, 2014.